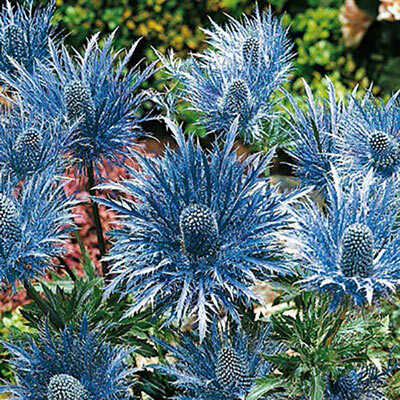 Unique, thistle-like, steely-blue flowers with pincushion centers. Extremely long-lasting and can be used as cut or dried flowers. Unique foliage complements lacy flowers. We have assembled some of our best selling Perennials that butterflies love and have put them in this assortment below. All of the varieties on this page attract butterflies. You can buy the complete garden or the individual item that fits your need. You will find plants in all sizes and colors. Winter Care: Protect from excessive winter moisture (standing water). Flower Form: The 1 1/2" pineapple-like heads are subtended by several ruffs of delicate, pinnetely cut, steel blue bracts. Foliage Type: Lower leaves heart-shaped, up to 6" long with margins covered in spiny teeth. Stem leaves palmately lobed, tinged with blue. Additional Information: This has an extended bloom time as the side branches produce abundant, albeit smaller flowers. These, along with the terminal flower forms an open, broad conical flowering head.